I rather glibly suggested 1967 for this month’s Past Offences classics challenge because it is the year of my birth. The disconcerting aspect of having books written the year I was born considered classics didn’t hit me until later. Eh gads but this ageing business is forcing me to confront some horrible truths. To be honest an Inspector Wexford novel would not have been my first choice for the challenge. Indeed it was somewhere around my 9th choice. I have written before of my disdain for Wexford because he came into my life when he was a BOWG (boring old white guy) and I was an idealistic young feminist (undoubtedly also boring as zealots generally are). But I don’t own very many classics, there are no second hand bookstores with shelves full of choices ’round here and my local library isn’t exactly replete with 47 year old crime novels. 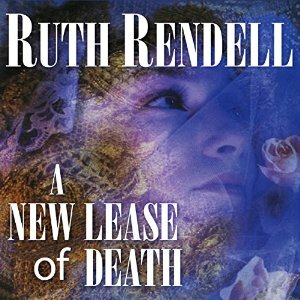 A NEW LEASE OF DEATH (or SINS OF THE FATHER as it is known in the US) was published in the year I was born (at least in the UK) and I could dig up an audiobook copy without incurring any expense. My one line review is that reading it has not changed my opinion about Wexford. It takes a few more lines for me to have a bit of a rant. The book’s central premise is that there is a young man (Charles) who wants to marry a young woman (Tess) but Charles’ father (Henry Archery, a vicar) can’t condone the union. Why? Because Tess’ father (Harry Painter) was convicted and hanged for battering his elderly employer to death with an axe some 16 years earlier and he doesn’t want his son marrying a murderer’s daughter. The case was the first one Chief Inspector Wexford had run on his own so Archery approaches him with a plea. A hope really that he has “… just the faintest doubt, the shadow of a doubt of Painter’s guilt.” Wexford remains convinced of Painter’s guilt but is happy enough to give permission (is it needed?) for Archery to conduct a bit of amateur sleuthing. The vicar is not the only one who assumes that criminals beget criminals. Wexford hadn’t given Painter’s daughter a single thought since the case was wrapped up but if he had “…he supposed he would have counted her lucky to have become an anonymous manual worker, with perhaps already a couple of petty convictions” rather than the Oxford scholar she has actually become. Even Tess concurs with the vicar, saying “It would matter if he had done it only he didn’t. I told you why he was hanged. I didn’t mean he’d done it”. Young Charles is the only one I have any time for when he pronounces “People are what they are not what their parents did” but he’s a lone voice in the wilderness here. This isn’t the only jarring note of the novel. There’s the soppiest of romantic angles. Not the one between Charles and Tess, which is perfectly fine, but the one between the vicar and a woman he meets while sleuthing. I can’t decide whether it is pathetic or sad or completely unbelievable. All three? Then there’s the fact there is no mystery to speak of. Maybe 1967 readers weren’t as well versed in the twists that might accompany a whodunnit but I thought the resolution screamingly bloody obvious early on. It was like being at a children’s panto where no one was shouting “he’s behind you” but everyone should have been. And even if I hadn’t cottoned on to the twist I would have been bored by the storyline. The sleuthing, such as it is, is very insignificant stuff. The characters are dull too. Wexford pontificates, his offsider Mike Burden looks down his nose and Archery mopes forlornly and investigates ineffectively. But Tess’ mum takes the cake. She’s not at all proud of the fact her daughter’s made it to Oxford but wants her future husband to know the girl can cook well. Eh gads yet again! This is the year the Beatles released Sergeant Pepper, Barclay’s Bank installed the world’s first ATM, homosexuality was decriminalised in England and abortion was made legal. This is the modern bloody world people and Tess’ bloody mother is only interested in whether her daughter can cook! Eh gads (for the last time, I promise)! This entire storyline with its pompous people and impossibly stuffy dialogue would have been at home in the middle of an Anthony Trollope novel which is all well and good for a family saga of 1867 but a bit worrying in something from a hundred years later. Is the gulf between now and 1967 that great? Or is it more to do with differences between Australia and the UK? Here it’s a bit difficult to be opposed to the children of criminals given how white settlement of the country began, so perhaps this is just one of those geographical oddities that make the world so interesting (and me so grateful to have been born when and where I was)? I’d hate anyone to think my lack of enjoyment of the book is an indication of a lack of enjoyment of the challenge at Past Offences where every month a new year is selected and people read books or watch movies from that year. It’s jolly good fun and for those of us more used to modern times it offers a great way to check out some of the genre’s classics. Why not join in? This entry was posted in book review, England, Ruth Rendell and tagged Crimes of the Century. Bookmark the permalink. Bernadette, if 1967 books are classics then books from my birth year must be written on parchment. I would agree that some aspects of English society in the 1960s seemed closer to the world of the 1920s and 1930s in attitude than the modern world. It seemed that abortion and legalised homosexuality were only for the upper classes, and the elite were somewhat shocked when ordinary people also wanted these freedoms. I can’t honestly say it disappointed me Margot but only because I had such low expectations to start with. I’ve actually enjoyed a couple of the much later Wexford novels but these early ones are not my cup of tea at all. Funny how I find this more dated than some of the earlier novels from Dame Christie. I can remember those attitudes being all too prevalent in 1967 — I grinned especially at the memories evoked by your “young woman says she can’t go into a church wearing jeans” line. The idea of criminality being hereditary was still very much around, and taken seriously by some. I was a 17-year-old in England at the time, and those were aspects of the culture to which we were all earnestly being counter. I too am not very keen on the Wexfords — on the whole, I vastly prefer Rendell’s other work — but I’ve never really noticed her getting too much wrong with her settings. I have been asking around and it definitely seems that we might have been a bit more laid back here in Oz even at that time – at least on the issue of heredity – though apparently other social conventions were clinging on strongly despite it being the swinging 60’s and all. I love Ruth Rendell’s mysteries, esp the ones written as Barbara Vine. Maybe not your cup of tea but rest assured the late 60’s and into the 70’s was still a time when people were very judgemental & narrow-minded. Of course by the time you were a teenager in the 80’s, the world had changed considerably. Hope your next ’67 book is more enjoyable! I have got my name down at the library for another ’67 book but don’t know if it’ll arrive before the end of the month (though I am curious to know who else is reading the damned thing). I’ve not tried any of the Barbara Vine novels for a long time but should probably revisit. I always loved the Wexford novels, although I do not remember this one in particular. I assume I read it but when I don’t know. Possibly it seemed interesting to me since I was from the US. If you think things were bad in 1967 in the UK, imagine the Deep South in the US. Although I never met anyone who worried about heredity in that way. In 1972, I did witness a US Air Force officer’s wife being sent home (to change clothes) from the Officer Wives Club meeting because she was wearing a pantsuit, not a dress. And because we were on an Air Force Base, I am sure it had nothing to do with being in Selma, Alabama. Oh I can certainly imagine the type of scene you describe Tracy…in country Australia (where I lived for 3 years during my early 20’s…so late 1908’s) there were pictures of the Queen on every wall of a public place (pubs, returned soldiers’ leagues halls and so on) and the dress codes even then were very strict. I could well imagine that kind of snobbery but am still reeling at the notion someone would think a woman unsuitable purely because of her genetics. I’ve never enjoyed the Wexford novels – Rendell always seemed to be talking about people I never met in real life – and yes, I was around in the 60s, albeit young. And dull… dull… dull… To coin a phrase – eh, gads! We’ve already done my birth year! 😉 1967 was desperately trying to be “modern”, but progress was patchy. Still is! People had odd ideas about heredity. They still kind of thought that CLASS was hereditary… Must reread this one. It sounds terrible! People really did hate long hair – on women as well as men! We were so sick of hairstyles that required sleeping in rollers, backcombing and hairspray. We just brushed it. It was a great year for telling young people that they were doing everything wrong. OK, OK, yeah, I was 16! We are as one on this one Bernadette – loved your review! You nailed it, AND made me laugh. Let’s hope for a better year next month…. Glad I could make you laugh Moira. Like you I am a bit surprised to see that Rendell didn’t start out as any kind of cutting edge social commentator. Unless, of course, that was exactly what she was doing. It’s so very long since I read the novel that I can’t honestly remember, but throughout her career Rendell has had the habit of presenting even the most obnoxious characters without too much overt adverse criticism, leaving it to us to infer their obnoxiousness from the way they behave. Is it not possible that she’s presenting these attitudes to us as ones we ought to ridicule? At the very least, as I say, she paints the attitudes and misconceptions of the time fairly accurately, as I remember them. In today’s terms — and even in the terms of a decade later — they were bizarre. Thank the Flying Spaghetti Monster most of us have moved on since then. I started out thinking that is what she was doing but I think the fact she didn’t have a single character actively oposing the notion that this heredity thing is nonsense negates the idea. If you were reading the book in 1967 and you already thought that bad people would have bad children then you wouldn’t have seen any reason to ridicule Archer’s idea or even to question it because nothing in the book would have struck you as at odds with your beliefs – the people only seem ridiculous if you already disagree with the view. Of course there was Charles but (a) he was a fairly minor character and (b) even the kindest of observers would have been struck by his desire to get into Tess’ pants and not really thought him an equal adversary to the weight of opinion in the book. I think if Wexford or Mike Burden or someone of significance had genuinely opposed Archery – instead of all buying into the plan to prove Painter’s innocence as the only means of saving the doomed lovers – then it would have been a different kettle of fish. The final nail in the coffin was the ending – it’s such a cop out – it leaves everyone able to get away with not addressing the whole heredity thing after all. I agree Bernadette: it would be nice to think she was leaving you to judge the idiotic preoccupations of the characters, but it doesn’t really stand up as an idea. Bernadette: You are but a mere youth at 48 with your best years yet to come. Wexford … I have read all of them, and there have been ones I loved, and ones I didn’t really love. It’s been a while, but I seem to recall I liked all the ones in the middle, but not so much the early ones and not so much the last few. I read one Wexford years ago and it was OK to me. Now I’ve got a few on dvd at the library and can’t wait to get them. This is my memory of having to wear a skirt to school. It is quite funny to me now. No one said a word. Anyway, I’ve digressed from Wexford’s books. I will watch the dvd’s and see how they are. You’re lucky to be able to get the DVDs Kathy – they’re quite difficult to get hold of (I’ve been trying so I could use one for a book vs adaptation post). Some of the middle and later Wexford books are better than this one (I’m partial to ROAD RAGE though haven’t read it for years). That’s a great story about your slip Kathy…I do think that schools can still impose ridiculous rules even now – I know the school I went to still makes girls where ribbed stockings – which are quite thick and hot – quite preposterous in a country where it is often 40C (about 110 of your degrees). I agree with you about Wexford, I just can’t seem to get excited over Ruth Rendell period, but I do about Crime Fiction of the Year! Great review! Thanks for the kind words Peggy. And it’s nice to know I’m not alone being outside the Rendell fanclub.